James J. Waldenberger, a partner at Kline & Specter, is an experienced litigator who has a wealth of hands-on experience in personal injury cases that has resulted in an impressive record of legal victories. Since joining Kline & Specter in 2007, Waldenberger has obtained a litany of seven-figure verdicts and settlements in practice areas ranging from medical malpractice, product liability, premises liability, auto accidents, workplace injury and child sexual abuse. His wide-ranging record of victories has earned Waldenberger inclusion in the 2017, 2018 and 2019 editions of the peer-review publication Best Lawyers in America. In one verdict, Waldenberger won a $5.5 million jury award in Philadelphia Common Pleas Court for a mentally disabled man who was rendered a quadriplegic when the commercial van in which he was riding struck a utility pole. In another verdict, Waldenberger won $1.4 million for a Philadelphia man who died after doctors missed bone cancer in an X-ray of his right knee, leading to a spread of the cancer. Most recently, in November 2018, Waldenberger won an $800,000 verdict in a case involving a Philadelphia woman who was injured in a fall at a nursing home, her injury resulting in eventual amputation of one leg. In an arbitration award, he won $5.5 million in Philadelphia for a man who sustained eye muscle damage during sinus surgery that resulted in permanent double vision. $5.75 million for a man who suffered catastrophic brain injuries when his car was struck by a 36-ton dump truck in Delaware County, Pa.
$5.35 million against the designers and builders of an industrial factory where an improper platform and equipment layout created a blind corner, resulting in a worker being struck by a forklift and suffering a foot injury that required amputation of his leg at the knee. $4.2 million for an infant who suffered brain damage when a truck collided with the car driven by her mother at an intersection at which there was inadequate traffic control. $4 million for a worker injured at an industrial site after he was thrown into the side of his truck by a sudden blast of natural gas caused by another worker. $3.6 million for an infant and his partents following a delayed birth delivery that resulted in brain damage. $2 million in a medical malpractice case involving the death of a man with a congenital heart condition whose complaints of palpitations were ignored by his cardiologists. $2 million against the Philadelphia Department of Human Services for the improper placement of a five-year-old girl in a home for which DHS did not perform an adequate background check. The girl was raped by another child at the home. $2 million for the family of a 17-year-old who died after an emergency room visit where a heart infection was not diagnosed and timely treated. $2 million for a 17-year-old worker who was killed when a tire he was helping to inflate exploded at a Pennsylvania Turnpike rest area. $1.7 million in a case involving the death of a factory worker who fell into an industrial tank because of inadequate safety measures at the plant. $1.5 million in a premises liability case for a woman who suffered cognitive impairment following a trip and fall incident. $1.4 million in a case that involved the death of man whose doctors failed to diagnose a dissecting aorta. Settlement was achieved while a jury was deliberating a verdict at trial. $1 million – despite a $500,000 government liability cap -- from the City of Williamsport, Pa., for the family of a man who died after a police car smashed into his vehicle. The city also agreed to make changes in police pursuit procedures and the offending officer was fired. Due to his extensive trial experience, Waldenberger currently serves as an adjunct professor at the Thomas R. Kline School of Law at Drexel University, teaching Introduction to Trial Advocacy. Prior to his work as a plaintiffs' attorney, Waldenberger represented defendants in personal injury and product liability cases at two Philadelphia law firms, Marshall, Dennehey, Warner, Coleman & Goggin, and at Goldfein & Joseph, PC. Waldenberger attended Villanova University as an undergraduate, earning an English degree with honors. He also attended Villanova for law school, where he was a member of the National Moot Court Team and participated in tournaments in Tennessee, Minnesota and North Carolina. 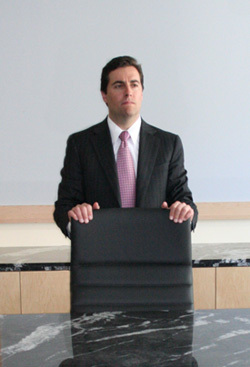 Waldenberger is a Fellow of the Academy in Trial Advocacy. He is a member of the bar in Pennsylvania, New Jersey and the U.S. District Court for the Eastern District of Pennsylvania.